PT Reska Multi Usaha - RMU is a well-established company in Indonesia, running business in train services. 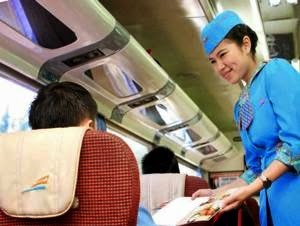 PT Reska Multi Usaha has main business focus in restoration, service on train (SOT), catering, parking, cleaning service, as well as general trading. PT Reska Multi Usaha is a member of state-owned railways operator PT Kereta Api Indonesia (Persero) or KAI Group. PT Reska Multi Usaha was formed by KAI Group and Yayasan Pusaka on 2003. At present, PT Reska Multi Usaha is 95.01% owned by KAI Group and the remainder of the shares belonging to Pusaka Foundation. Headquartered in Jakarta, PT Reska Multi Usaha now has 6 area offices spread in all over Indonesia ; Jakarta, Bandung, Semarang, Yogyakarta, Surabaya and Palembang. As of December 2016, PT Reska Multi Usaha served 80 trains with 123 Restaurant Trains (KM), 10 land kitchens in 6 area and managed parking location at 114 stations. PT Reska Multi Usaha generally recorded a good performance in 2016. According to PT Kereta Api Indonesia (Persero) Annual Report 2016 as quoted by JobsCDC.com, PT Reska Multi Usaha registered a 16.7% growth in total revenue in 2016 of Rp387.68 billion as compared with Rp332.30 billion in 2015. Total gross profit increased by 13.6% from Rp87.44 billion in 2015 to Rp99.32 billion in 2016. Minimum SMA/SMK with minimum SKHU score of 6.00. Copy of KTP and KK. Copy of academic certificate and diploma (legalized). Notice letter of Healthy condition accompanied by height and weight data from Hospital or clinic. JobsCDC.com now available on android device. Download now on Google Play here. Please be aware of recruitment fraud. The entire stage of this selection process is free of charge. 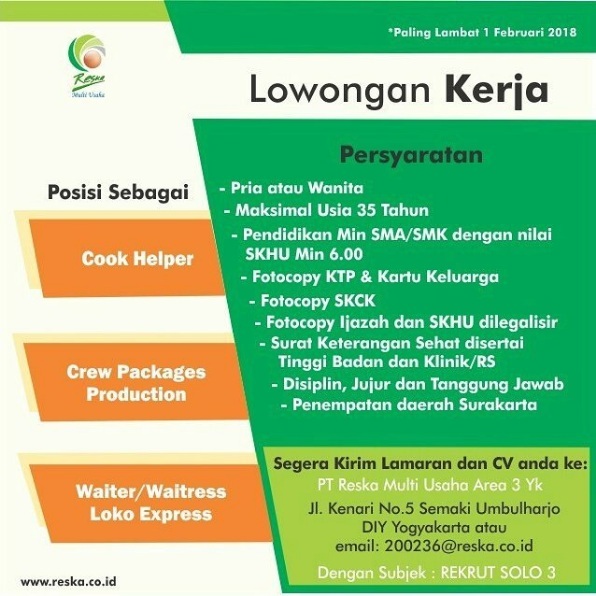 PT Reska Multi Usaha - SMA, SMK Cook Helper, Crew Packager, Waiter Waitress KAI Group February 2018 will never ask for fees or upfront payments for any purposes during the recruitment process such as transportation and accommodation.